Went to Il Forno on Duke Street in Liverpool for dinner before going to see the early evening showing of The Informant at FACT. Things started well with quick service and an excellent swordfish tart starter (with a name far too long to remember). Unfortunately this is the point at which I have to become Mr Grumpy. If a waiter announces that your pizzas are amongst the 10 best in the whole country they’d better be very good. I’ve certainly had better pizzas from two other restaurants in Liverpool, two Liverpool takeaways, a restaurant in London and a takeaway in Sheffield. Unfortunately both pizzas we ordered were described as bland so it wasn’t just me. Personally I’d have prefered a more interesting pizza that was half the size. To be fair I’ve had far worse ones in lots of places too. Then I could have tried one of the deserts they offered us three times. Overall opinion starter good, service OK and I’d try a different main course if I went again. 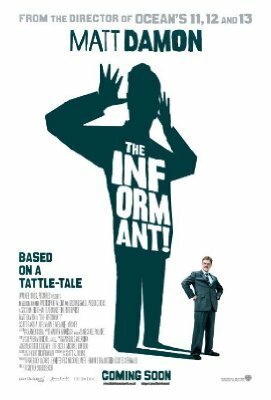 So on to the real main course of the evening as it were, the film The Informant picked largely because nothing else was on that appealed. First could someone explain to me why Matt Damon was playing Mark Whitacre in the style of William H. Macy. Did he have a bet with George Clooney, couldn’t they get William H. Macy himself or did someone decide that William H. Macy wasn’t a big enough name to star so cast Matt Damon to try and sell the film to audiences? The story itself was a mess that every time it threatened to get interesting ran away from itself. The meat was the technicality of the various crimes, deceptions and alleged crimes. Each time they got close to one they brushed it out of sight as though it was scary stuff requiring a bit of (oh no!) thought and comprehension. It was like watching a heist film in which showing a safe being cracked was technical and boring so lets not bother. Hang on though did they really think this film was going to attract an audience who were looking for a no brainer action flick? Then there was the really odd sound track and the 1970s retro font. Fine except the film was set in the 1990s. There were a large number of supporting characters who became interesting and then vanished. Scott Bakula in particular was there and then suddenly gone treatment. I’d make a Quantum Leap reference but it would be too easy a joke. Now you may say this was based on a real life story but as they made clear before the film started they’d taken liberties with it. So why not take the liberty needed to make it interesting? The Informant just didn’t seem to know what it was: docudrama? docucomedy? In the end it was just docudisaster. As it stands it’s a bad attempt at making a film in the style of a sprawling based on real life drama from the ’70s. Maybe with William H. Macy and the Coen brothers directing possibly focusing on the investigation of what must have been an ever more bizarre situation it could have been a film worth seeing. Personally I’d suggest saving your time and money.